One of the worlds most famous artificial intelligence and rich data PHD candidates, Randy Olson has stripped back the best and most loved destinations in Europe to make an algorithmic plan for what is being called “The Most Epic European Road Trip Ever”. It could be, from today, something to put on the baby boomer bucket list we think. It is a post being discussed in media all over the world so don’t be shy… take a good look today at the travel dream of many. According to his blog, to calculate the trip, Olson picked out a list of stops from this Business Insider article and then removed the places that required traveling over water. After that, Olson plugged the stops into a Python code to calculate the shortest distance between each stop. The road trip makes 45 stops in total, and takes people through the most ideal destinations listed in a recent Business Insider article from Tuscany on the Italian coast to Santorini in Greece, all the way north to lapland in Finland and west to Ballybunion in Ireland. In total, the trip covers 16,287 miles (26,211 km) and 14 days of driving, and Olson says you should expect to dedicate at least 3 months if you’re going to take on this road trip. “You may notice that eastern Europe is somewhat underrepresented in this road trip, so if you want the full taste of Europe, it’ll be worthwhile to add some stops between Poland and Estonia,” he says. 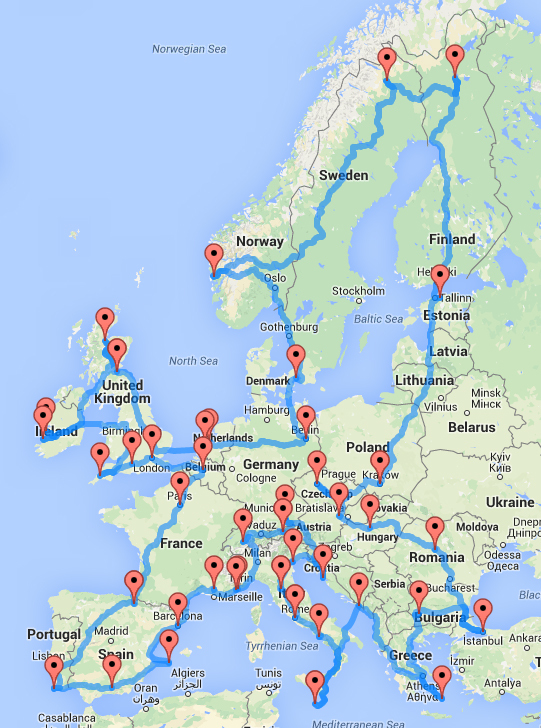 Have you every done a European Road Trip? Is it on your bucket list?